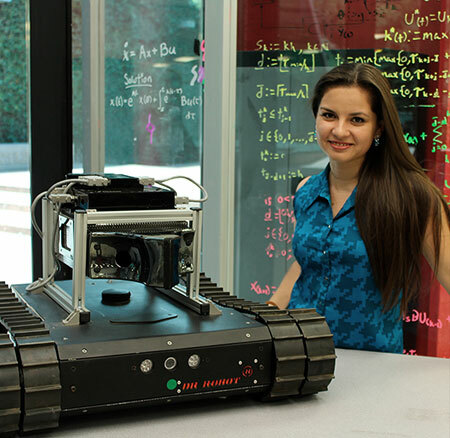 (Nanowerk News) During her postgraduate stay at the Tecnológico de Monterrey (ITESM), Blanca Lorena Villarreal developed a device that allows multiple robotic platforms to follow the path of certain odors. A technology which could aid the search and rescue of people in case of natural disasters such as earthquakes, hurricanes or floods. The olfactory system is based on artificial intelligence algorithms that enable the detection of the scent of alcohol, but with some modifications to the system and the algorithms it can recognize odors and toxic gases or elements. "In rescue missions it might recognize blood, sweat or human urine," said the former student of Tec de Monterrey. Blanca Lorena Villarreal and a rescue robot. In the first phase of development, the student wondered about how living things carry out the process of odor recognition and then transferred that knowledge to the mathematical sciences, and thus translated it into algorithms. "We note that, biologically, animals perceive the direction of an odor using two characteristics: it comes at different concentrations to the nostrils, and, because it is appreciated with a time difference. These two factors can identify from which a certain aroma comes," explained the researcher. This is how chemical sensors that mimic the nostrils, and which are separated by a septum, will perceive specific odors. The data, said Lorena Villarreal, is sent by radio to a computer, where it is analyzed in real time to know the origin and direction of the aroma, using programmed algorithms. "Unlike other olfactory systems, this has the feature that in each cycle of ventilation the air chamber empties, making sensors ready for a new measurement," says the doctor. Thus, the technology takes only one cycle to detect that there has been a change of direction in the path of smell, which enables the robot to perform the tracking faster. Later the young researcher implemented this olfactory system to a robotic platform funded by CONACYT, to achieve its deployment to hypothetical emergency zones. Blanca Lorena Villarreal is developing algorithms that allow the discrimination of odors, to give the robot some artificial intelligence that contributes to decision making processes. For developing the "electronic nose", the researcher has been recognized as one of the most innovative young Mexicans in the Mexican edition of MIT Technology Review, by the Massachusetts Institute of Technology.